Gamadecor amazes once again with the Emotions series, on this occasion with the E4.00 model which uses KRION as the main material in its design. The combination of KRION and Natural Oak give the kitchen an enhanced aesthetic, exceeded only by its practicality and large work area which allows stools to be incorporated and turned into a table. 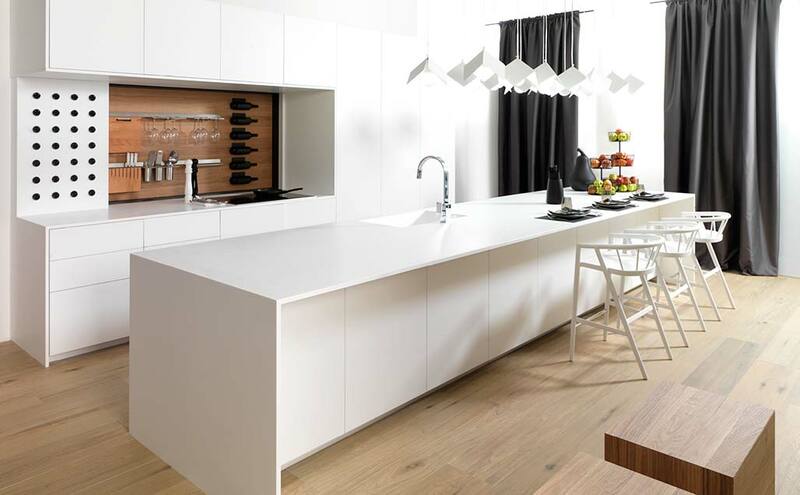 PORCELANOSA Kitchens is characterised by elegant, practical designs, sometimes ground-breaking and amazing. In the E4.00 model, the sliding shelf area catches the attention, used as a spice rack, all made with KRION 1100 Snow White.